First and foremost, Merry Christmas & Happy Holidays! I hope everyone had/is having a lovely time with their loved ones this holiday. Today we bring you a pretty big update. PvP is now reverted to 1.7/1.8 PvP as much as it can be. Weapon values, armor values, attack speed, etc should be as close to 1.7/1.8 as we can get it. Also, sweeping strikes is no longer a thing. You will still get the visual that your sword has done a sweeping strike, but it will not hit more than one target. Enchanting has been enabled but has been reverted (somewhat) to pre-1.9 enchanting. Enchanting an item with a level 30 enchant will consume all 30 levels. However, you will still need to use the 3 lapis in the enchanting table to do so. With this, experience has been enabled and you should now be able to get it as normal. Anvils have also been enabled. Combat log system has been added. With that said; it is unknown when the release of Hytale will come. So that begs the question, what next? Well.. there are three options. Option #1; we close Killion until Hytale's release. This is not the option that we want but will ultimately leave that decision to the community. The infamy update that we announced in this thread has been pushed back until more weapons and armor have been implemented. At the time the infamy update is made live, we will also be expanding the free world map. 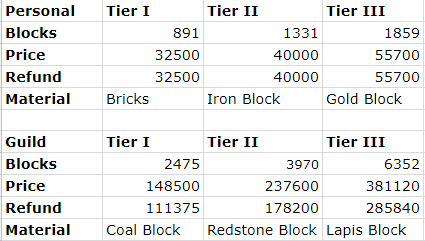 Guild farms have had their limits increased to 3 (previously 1). This stones are still limited to the leader; however, we will be implementing a feature that scales this limit based on the number of members in your guild. For example, for each 10 members, your limit is increased by 1. Guild farms now provide protections (all BUT chest protection), and no longer need to be placed within a dedicated guild protection stone. The price has been increased by 15K for these protection changes; however, these farms now offer a 75% refund when broken. Infamy has now been revamped. When gaining infamy points, the sound will only play once. Your added infamy points will no longer show in chat, but will show on the scoreboard on the right side of your screen. That scoreboard will disappear 10 seconds after you're finished farming. We will not be resetting infamy. The points you have now are the points you keep. Your infamy points will then be set to 0. When you die, you will now lose money as a form of bounty. The money loss depends on your infamy points and scales up to 25% of your total balance. Further network optimizations were also done. We are now releasing the Nether along with Capture the Portal for guilds. It takes 35 seconds to capture the portal. Once captured, the guild will have sole access to the Nether for 4 hours. Protection blocks can not be placed in the Nether. Further weapon optimizations have been made. Attack speed now has an effect when attacking. This means if you are using a sword, there will be a “cooldown” between attacks. This cooldown is internal and is not in line with the 1.13 attack system. In other words, players may spam-click without penalty. Damage will not be dealt until this internal cooldown period is over. When damage is dealt, it will be full damage without penalty. We believe this will benefit those who enjoy the 1.7 attack system while also providing us room to implement custom weapons in the future. We will be terraforming the land around it in the coming days. You can now ignore other players in chat using /chat ignore name. This will make you unable to see their global chat and private messages. You can now use /delhome bed to delete your current bed spawn point. At 23:56 EST we were targeted by a DDoS attack that lasted for approximately 10 minutes. This is not the first time we have been targeted by a DDoS attack, we have already been targeted twice since launch. This attack however was the largest - it topped out at 10.64Gbps and 505,624 packets per second before affecting our availability. We had plans in place to protect the server from these threats however they were still in the process of being rolled out, so the extended downtime after the attack this morning was to apply parts of those plans. We have migrated our servers over to a system better suited to deal with these attacks which will work better with our long term server and community protection plans and will continue to improve as time goes on. There's no changes required from the community due to this, everything should continue to work as normal.